το γράμμα που έχω στείλει. 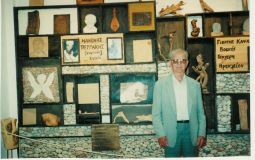 Since the Professor of Ophalmology George Markakis started collecting old things, he received numerous donations that enriched his personal collection which consists the corner stone of all of the museum’s collections. Through the years, the museum has received many donations. The donors are divided into two categories. The great donors, whose donations consist a basic part of the main collection of the Museum and other donors who contributed as well -by giving out one single object –or even with ‘mantinades’ and other records of oral culture – to the enrichment of the Museum’s collections.